Announcement Welcome to my Etsy store! I have been traveling to conventions with my artwork since April 2011. I have two online stores as well as my convention stock, so if there's anything you need a higher quantity of, or something that you remember seeing that I do not have listed, please feel free to convo/email me to see if I have it! I ship orders out on Tuesdays and Wednesday due to my convention schedule, but if time allows then I will try to send them out more frequently than that. Thank you for visiting and have a wonderful day! Welcome to my Etsy store! I have been traveling to conventions with my artwork since April 2011. I have two online stores as well as my convention stock, so if there's anything you need a higher quantity of, or something that you remember seeing that I do not have listed, please feel free to convo/email me to see if I have it! I ship orders out on Tuesdays and Wednesday due to my convention schedule, but if time allows then I will try to send them out more frequently than that. Thank you for visiting and have a wonderful day! This pin is beautiful. The glitter is great! This tape is sooo cute! I can’t wait to use it in my planner! Arrived quickly and my boyfriend loved it! 500-person team spread out across four locations: North Carolina, California, Mexico and Latvia to integrate with E-commerce stores. Prints on demand and drop ships directly to customers. For purposes of EU data protection law, I, Melissa Francis, am the data controller of your personal information. If you have any questions or concerns, you may contact me at mimosa.studios@gmail.com. I am typically only able to ship on Tues and Wed, although I will do my best to ship next day whenever possible. If you need a package to have insurance in case of loss, damage, or theft; please upgrade to priority shipping as this includes $50 free shipping. Basic shipping only includes a tracking number. If you need a package quickly, please message me first to ensure that I am not traveling to a convention. Most of my products have a 3-7 day processing window in case I am out of town, so if something needs sent prior to that, I will need to be aware. Purchasing next day shipping does not affect the processing time to complete orders, so arrival would be 4-8 days if not previously discussed. I am not responsible for packages if an address is typed incorrectly. If this happens, I will only reship the item when it is returned to me, after you pay for the extra postage. If a refund is requested, it will be just the product cost, less shipping and listing fees, after the product is returned to me. If your package shows delivered but you did not receive it, please contact your local post office. Most of the time, it has been incorrectly delivered to the wrong apartment/house. If the item is returned to me, then I will reship it once postage costs are paid, or I can refund the product cost of the item less shipping and listing fees. Please note, items can take weeks or months to be sent back to me. 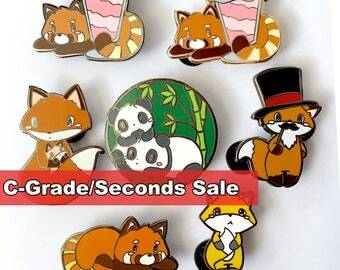 The Regular Grade is the highest quality I offer, but due to the hand made nature of enamel pins, most will have minor cosmetic flaws, such as surface scratches, dull spots, metal imperfections, and possible uneven enamel; so they are "nearly perfect." Although the Regular Grade that I send out is often Collectors Grade, that is the exception and not the norm. If you only expect Collectors Grade, please convo me before placing the order to make sure I can accommodate you. Even still, this is subject to interpretation.